The tragedy for those with traumatic brain injury (TBI) is that there have been limited options for treatment in the past. Treatments such as cognitive behavioral therapy, vestibular retraining, or hyperbaric oxygen offer slight benefit, but research does not show consistent results. Medications are mostly directed at symptoms, not the cause of the problem – brain injury. Now, there is a revolutionary new treatment for TBI which we have been developing. Light is the answer. Yes, light!! But not just any light – light in the near infrared spectrum. This is the light in the wavelength range of 600-1000 nanometers. Light that we cannot see, but snakes can see. And it’s the light that can penetrate scalp and skull to reach the brain. Perhaps the most exciting finding is that this infrared light can stimulate the energy production and repair processes within brain cells to help the brain recover from brain injury and stroke. In our clinical work so far, we have seen significant improvement in our patients with TBI. We have published a case series of 10 patients treated with near infrared laser phototherapy. In the course of only 20 treatments, these patients have seen significant improvements. Many were struggling with headaches, sleep disturbances, anxiety, mood regulation problems, impulsivity, relationship problems, depression, and joblessness. After treatments, headaches resolved in almost every case. All the patients were sleeping better and were no longer depression. Many had improved anxiety. Relationships got better. All of the patients are now able to work. Subsequently, we have treated 35 more patients with similar results. The patients not only improved, but they continued to do well after the treatment was finished. Now, some patients are two to three years past the end of their treatment and they continue to retain the benefits they gained. 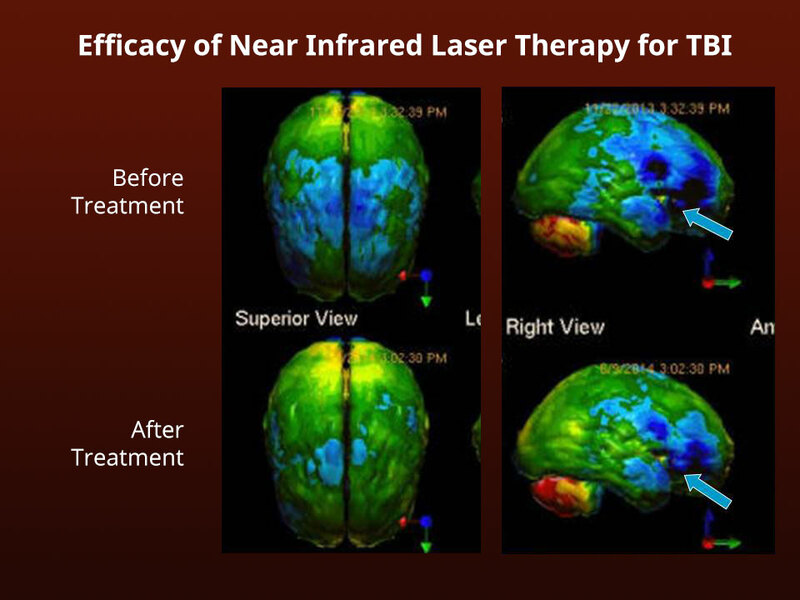 Our approach to near infrared laser therapy is not only effective, but it is long-lasting, as well. We are seeking funding to provide treatment to Veterans, first-responders, and others with TBI who might not be able to afford treatment otherwise. Often, TBI can lead to difficulties functioning and joblessness. It is a tragedy that those who keep our communities safe or serve our country may not be able to get treatment because of the effects of their injury. Here is where you can make a monumental difference. The Neuro-Laser Foundation has established a crowd-funding opportunity so that each and every person contribution (no matter how small or how large) will directly aid Veterans, fire fighters, police officers, other first responders, and those who cannot afford treatment.